The brewing of beer has been recorded for over 7,000 years. Originally a by-product of an agrarian culture, the brewing of beer evolved into a domestic profession performed by brewsters (a term historically representing women brewers before the general-neutral term “brewer” became prevalent, as is used today) and then transformed over the last three centuries into the highly industrial and technology-advanced profession of today’s modern society. This transformation was precipitated in part by advances in scientific technologies and instruments such as the thermometer (e.g., the alcohol thermometer and the mercury thermometers, invented by Daniel Fahrenheit) and the hydrometer (e.g., the alcoholometer or proof and Tralles hydrometer invented by Johann Georg Tralles, and the saccharometer invented by Thomas Thomson). In addition, advances in fermentation sciences by chemists Georg Ernst Stahl in the 18th Century and Louis Pasteur in the 19th Century resulted in brewed beer that has less bacteria and a longer shelf life. In the United States, beer has been brewed since the late 16th century. The brewing of beer has also been both directly and indirectly affected by legislative Acts passed by Congress and judicial rulings handed down by the courts for over two hundred years. For instance, the National Prohibition Act (Volstead Act) created Prohibition in 1919 by enabling the 18th Amendment, and the Cullen-Harrison Act amended the National Prohibition Act to pave the way to the repeal of Prohibition with the 21st Amendment in 1933. In addition, President Jimmy Carter signed H.R. 1337 on October 14, 1978, which included an amendment creating an exemption from taxation of beer brewed at home for personal or family use. The amendment in H.R. 1337 effectively legalized homebrewing on a federal level in the United States on February 1, 1979. In addition, the amendment is credited, at least in part, for the craft brewery explosion over the last 40 years as H.R. 1337 allowed states to pass laws regulating homebrewing under the powers granted to them by the 21st Amendment (which front-runner states like California, Oregon, and Washington passed by 1983, while the last states Alabama and Mississippi did not pass until 2013). Further, legislation passed in numerous Acts over the last 225 years have created and modified the United States patent system that provides the means for granting and/or enforcing patent rights, and the means for defending against those patent rights being granted and/or enforced. Similarly, courts around the nation have shaped the patent system for over 200 years. Since the first Patent Act of 1790, inventors have been issued patents for thousands of inventions including “beer” or “brewing” in the title with the various patent offices and agencies (e.g., the United States Patent and Trademark Office, or USPTO) of the United States Government. Patent No. 135,245 was issued on January 28, 1873, to Louis Pasteur for his work with fermentation in the patent titled an “Improvement in Brewing Beer and Ale” (pasteurization). Patent No. 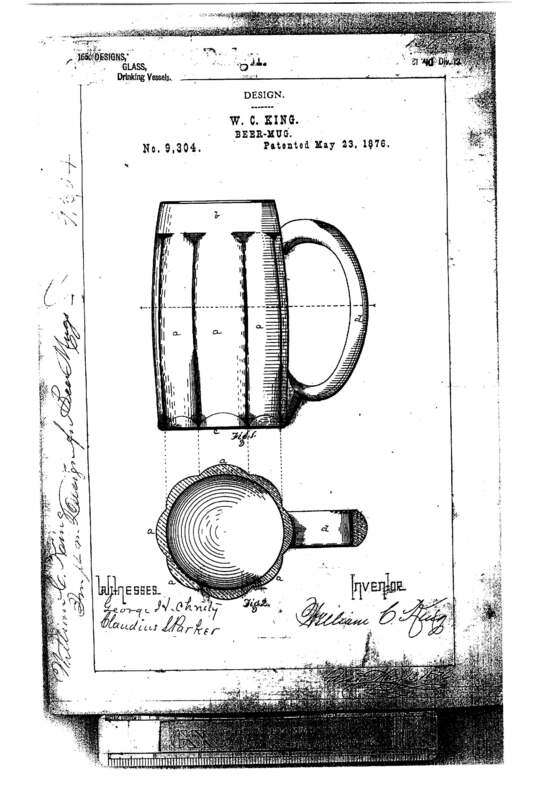 868 was issued on August 1, 1838, to Thomas Behan for an “Improvement in Brewing Beer and Ale.” Further, Patent No. 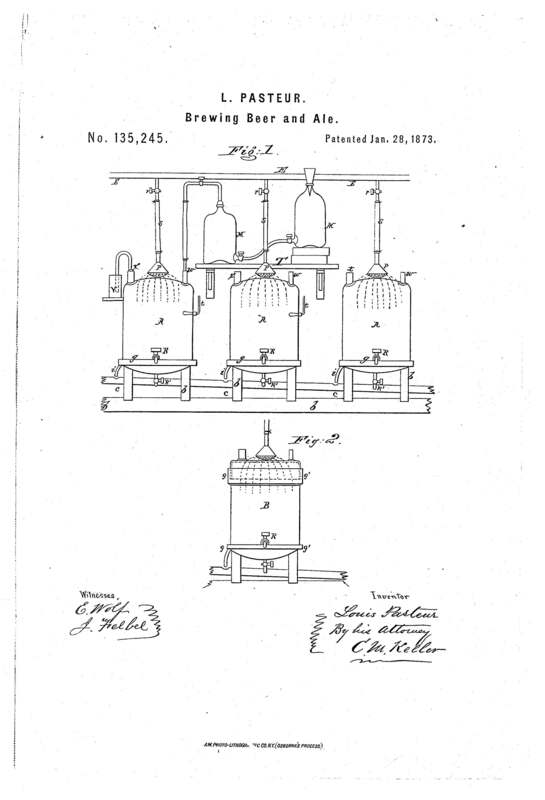 1,551,979 issued September 1, 1925, to Henry Deckebach, for a “Process and Apparatus for Making Beer of Low Alcoholic Content.” Of note here is that the ‘979 patent includes a description of a “means of removing alcohol from beer [without affecting taste] and recovering the alcohol that is removed,” and was filed in 1919 between the ratifying of the National Prohibition Act in 1919 and Prohibition going into effect in 1920. Patent No. D161,712 issued January 23, 1951, to N.W. Roop for “Drinking Mug”. Patent No. D582,213was issued on December 9, 2008, to assigned Boston Beer Corp for “Glass”. Although the focus here is on the patent system being utilized to protect rights in inventions related to beer, it is worth noting that beer itself has been provided as a reward for the making of scientific advances. For example, the Carlsberg Brewery outside of Copenhagen, Denmark provided an Honorary Residence with a direct pipeline to the factory next door. Per the will of the Carlsberg founder, Jacob Christian Jacobsen, the Carlsberg Honorary Residence was to occupied by ‘‘a man or a woman [picked by the Royal Danish Academy of Sciences and Letters] deserving of esteem from the community by reason of services to science, literature, or art, or for other reasons.” The most notable resident of the Honorary Residence is Niels Bohr, who was given the Carlsberg Honorary Residence for his work on the hydrogen atom, living there from 1932 until his death in 1962. After the passing of the last resident in 1995, the Carlsberg Honorary Residence became the Carlsberg Academy, which includes a conference center for the Royal Academy and an apartment for a visiting foreign scientist. While Carlsberg is fresh on the mind, Carlsberg and Heineken jointly own patents EP2384110 and EP 2373514 that were granted by the European Patent Office (EPO) in 2016, which protect a barley strain defined as improving the taste of beer and allowing for a more energy-efficient brewing process. These patents are currently being contested as protecting barley strains that are bred through conventional means of barley cultivation and beer brewing (as opposed to being genetically engineered), thus allegedly violating an EPO patent law which prohibits patents on conventional breeding. It is will be interesting to see how this case comes out, because it represents another case in a bank of high-profile, international biotechnology cases and because it may affect the fundamental processes brewers have used for hundreds of years to cultivate and brew with barley.